In 1993, both the Colts and Glassmen make the World Championship Finals for the first time. But while the previous four years of Glassmen's end-of-season placements (23rd, 18th, 17th and 13th) made that corps seem like it had a good shot at making the Finals in '93, Colts experienced no such ascendancy during that time period, placing 21st, 23rd, 22nd and 20th, respectively. Foreshadowing their success that week, Colts were the only corps in the Quarterfinals to earn a higher score in the Semifinals, gaining 0.70 from the night before to pass up Velvet Knights, the corps they would ultimately beat out for the 12th spot in the Finals. The title of Colts' 1993 show was "Iowa's Four Seasons," capturing the contrasting moods of the temperate climate of its home state. Entering the field to the strains of "Carol of the Bells," corps arranger Chuck Naffier's "Winter" quoted from a number of well-known Christmas carols, including "God Rest Ye Merry, Gentlemen" and "Do You Hear What I Hear," with red, white and green mistletoe leaf flags setting the visual stage. Hand-painted flower props opened up to introduce John Tesh's new age ballad, "A Thousand Summers," which, despite its title, was a salute to the rebirth of spring. Performance excerpt of the 1993 Colts. Gershwin's "Summertime" (from "Porgy and Bess") picked up on a stormy theme with the brass section in the form of a lightning bolt. But then the guard threw off their jackets and the heat on the field climbed to the top of the thermometer with a sultry interpretation of the famous melody. David Grusin's "The Heart is a Lonely Hunter" introduced autumn with the colors of falling leaves in the flags accenting the melancholy melody. After a huge company front, a short "Reprise" by Naffier brought the corps into the final part of the show and its first appearance in the Finals. 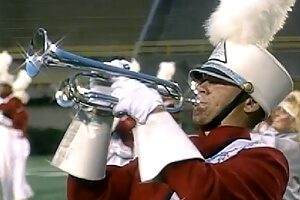 This week only, you can save on 1993 World Championship Audio and Video Performance Downloads on the DCI Fan Network. Buy the 1993 Colts Video Performance Download. (Available this week only for $3.99. Regular price: $4.99.) Buy the Audio Performance Download bundle of all 12 Finalists from 1993. (Available this week only for $15.99. Regular price: $19.99.) Offer ends Monday, July 25 at 8:30 a.m. ET.